Four bus loads of Metropolitan Chicago’s jubilant Punjabi community members were transported by Punjabi Cultural Society of Chicago (PCS) to Navy Pier to participate in PASSPORT TO THE WORLD: India Festival Celebrations at Chicago Children's Museum at Navy Pier on Sunday May 13th, 2007. The weather was beautiful. The event was to celebrate Asian American Heritage month of May. The program on May 13 began with a folk dancing procession on Navy Pier lead by Punjabi Dhol (drums) group played by Maninder Singh, Sukhi Basati and Kevin Atwal, while the members danced Bhangra pulling in many other foot tapping spectators. 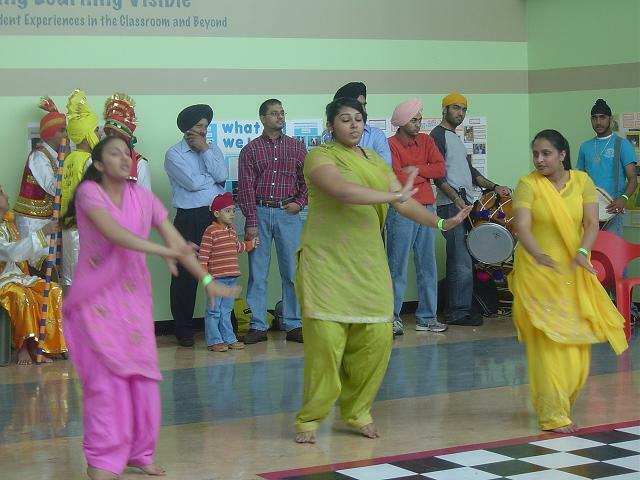 The program inside Chicago Children’s Museum included Punjabi Indian cultural performances and music, learning to sing Punjabi folk songs, playing Punjabi Dhol drum, demonstrations of how to tie a turban, and Bhangra101 dance lessons by Rajinder Singh Mago. The PCS children’s teams “Shaan Punjab Di” and “Kuriyan Chicago Diya” performed Bhangra and Gidha dances. The turban tying demonstrations were facilitated by Sikh American Heritage Organization. Free refreshments were also provided. “I am really impressed by all these Punjabi activities here in Chicago,” said Narinder Singh Bhullar a visitor from India who is also an editor of a major news paper “Punjabi Tribune” in Chandigarh India. “Passport to the World provides us an excellent forum and an opportunity to share our rich Punjabi Indian culture, fine art exhibits, music, dance and performing arts with the mainstream fellow Americans,” said Mohinderjit Singh Saini, managing director of the Punjabi Cultural Society of Chicago www.PCSChicago.org and ambassador for Passport to India. “It is very important for all, especially the children, to experience other cultures because this will strengthen their understanding of other cultures and of people who may look different or wear different clothing." “PCS has multiple days performances at Chicago Children’s Museum during this month long celebrations. We were here on May 10th. and again will be here on May 17th,” said Sunny Kular one of the coordinators of PCS’s participation. “This is a great opportunity to outreach to the mainstream community children who are going to become the leaders of tomorrow,” said Bhinder Singh Pamma, the PCS president. “PCS will also be participating at the Asian American Festival at Daley Plaza on May 21 through May 25, 2007. PCS will present “Sargam” dance group on May 21 and May 22, and “Balle Bhangra” on May 25 at noon,” said Amarjit kaur Atwal. The vice president of PCS. The event was organized by Bhinder Singh Pamma, Amarjit kaur Atwal, Ronny Kular, Sunny Kular, Amarpal Singh Matharu, Yadwinder Singh Grewal, Parminder Singh Ghotra, Harkirat Singh Sandhu, Sukhmel Singh Atwal, Thakar Singh Basati, Mohinderjit Singh Saini and Rajinder Singh Mago.